G.S Diamonds has more than 25 years of experience in cutting diamonds and has a wide circle of customers in the USA and over the world. We specialize in cutting precisely matching pairs of fancy shapes. We supply a variety of shapes such as half moons, trapezoids, shields, kites etc. In addition we have designed a collection of unique shapes. Our Israeli factory uses advanced technologies in the manufacturing process,enabling us to deliver high quality in a wide range of sizes in a reasonable price. We will be happy to supply customized shapes and sizes according to your needs. 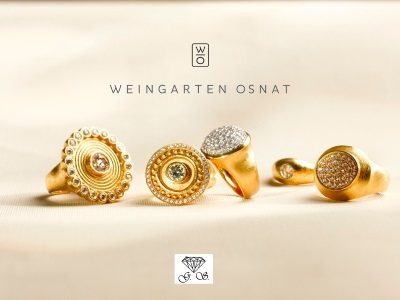 GS Diamonds in cooperation with the designer Osnat Weingarten (www.osnatweingarten.com) is proud to present their diamond jewelery collection at the Diamond Jewellery Show in Israel, February 14-18.2016.